Happy Halloween! This pick is another one that's only here because of the photo on the front of the card, and it fits perfectly with the theme of dressing up as something different for just one night. It features something that you don't see everyday on base cards, and that would be a specialty jersey. The card itself is a Jonas Hoglund of the Toronto Maple Leafs from the 2002-03 Topps set, although that's not the team he's playing for according to the jersey in the picture. 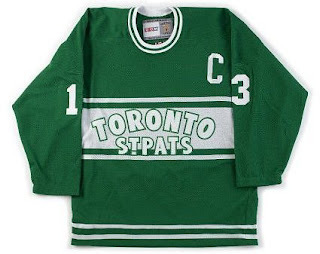 It's actually a Toronto St. Pats jersey that was only worn for one game on February 14, 2002. I love that they went with the brown pants, gloves, and helmets here as it just completes the look. 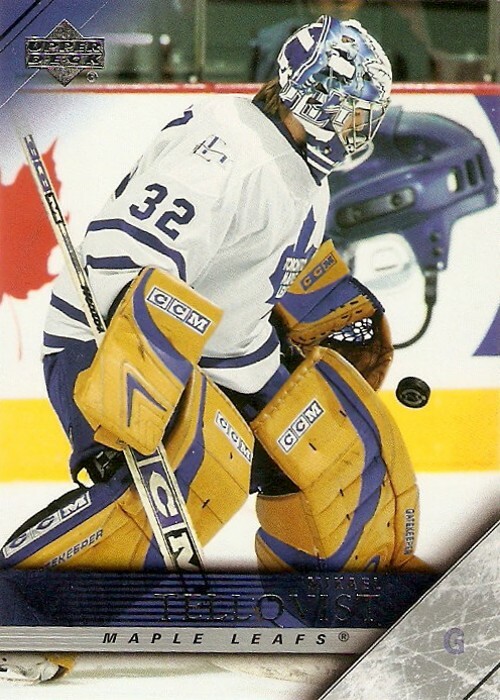 One thing I do wonder is what the leafs goalie (I'm assuming it was still Cujo at that point) did as far as the brown equipment. Here's a better look at one of the jerseys from that game, courtesy of Third String Goalie. By the way, here's a link to the post over at Third String Goalie that explains a little bit about the St. Pats and these jerseys. Take a look, it's definitely an interesting read, as always with TSG. 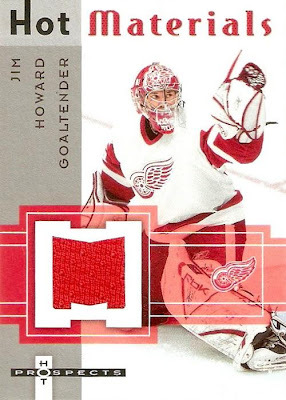 Also, has anyone seen any other cards featuring these jerseys, this was the only one I found in my collection, although I think there were a few more from this set. It's been a while now since I've updated this project, so it's nice to finally be able to do so. Back when I started the project, I searched high and low through my binders and boxes for cards that fit the requirements, and I did managed to come up with a few. That's where this trio comes in, they're were just the next three in the stack I had waiting to be scanned. 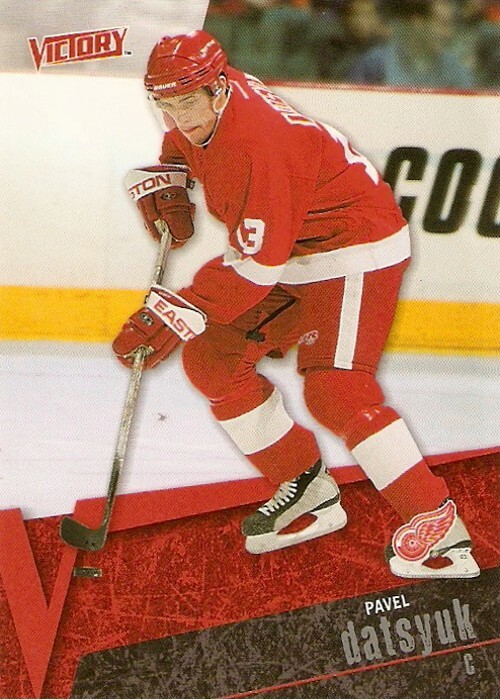 The first is this Mikael Tellqvist from 2005-06 Upper Deck. This one is a bit unique as he's not wearing different color equipment from signing as a free agent or being traded, as I believe they are from international competition with Sweden. Someone correct me if I'm wrong though, I'm not that in tune with what goes on in Toronto. 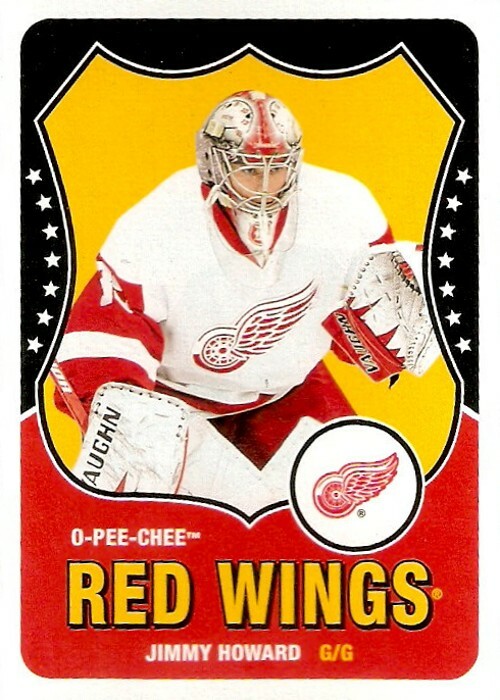 The second one is this Dieter Kochan from 2002-03 Between The Pipes, back when they actually had and NHL license and could show the actual team logos. As you can see in the picture, Kochan is shown with the Wild, but obviously has equipment from his time in Tampa Bay, where he spent the previous three seasons. Finally, the third one is this Jose Theodore from 1996-97 Pinnacle Summit. 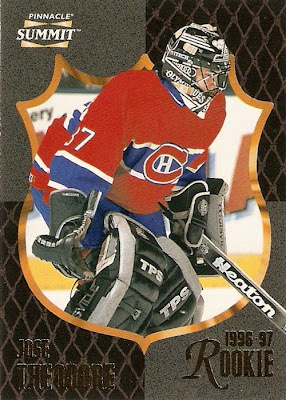 The picture is from his rookie season with the Habs, but you can see that he was still wearing his silver and black gear from his time with the Hull Olympiques of the QMJHL. I really hope I can find more cards from this time period, as there were some crazy base designs back then. So there's another nice mix to add to the project. I would say of the three the Kochan has the most noticeable differences between equipment and uniform, but to each their own. Last time around I showed off one of my many Red Wings jerseys. This time it's one of my many non-Red Wings jerseys. Well, kind of. It's long time Red Wings Chris Osgood, but from when he was playing with the Islanders. 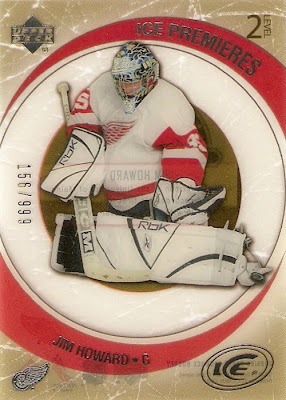 This one I also got as a birthday present, sometime around 2002-03 after the Red Wings acquired Dominik Hasek. As far as why I chose this one, its one of those things where I went to the shop looking to buy a jersey, and once I saw it I needed to have it. For some reason, I love the look of this jersey, even though most everybody seems to hate it. There's just something neat about it being bright orange and its something not many people have, at least around here. The first thing I notice looking at the front, other than the obnoxious orange, is the blue and white triangles darting in just below the Islanders crest. They're kind of awkward looking, but just work for some reason, or at least I think they do. Another thing I like about this one is how it laces up at the collar. something that very few of my jerseys have. Looking at the back, you've got the same triangle shapes darting in, this time just below Osgood's number. I should add that the color scheme looks great in person, as the numbers and letters really stand out with the blue body and white border. This one also has the Koho word mark and logo at the top, followed by the NHL puck logo. 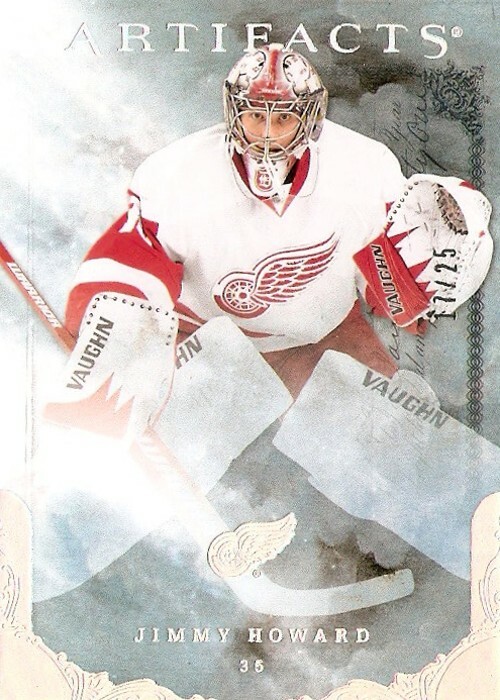 I've never seen any cards from this set before, but it's apparently from 2002-03 Upper Deck Mask Collection. Not the best view of the jersey, but you can definitely tell it's the same as I have above, minus the obvious fact that mine's a replica, of course. It's been a few days now since I've have the time to put together another one of these posts, so it's nice to be able to sit down tonight for a few minutes and write something about the hobby I love. This will be one of the older picks I've done, as it dates back to the early 90's, also known as the junk wax era for hockey cards. It's one of the awesome team checklist painting cards that Upper Deck used for a couple of seasons back then. This one, from the 1992-93 set, just happened to catch my eye when I was sorting through a box of base cards recently and I thought it would make a good candidate for this series. 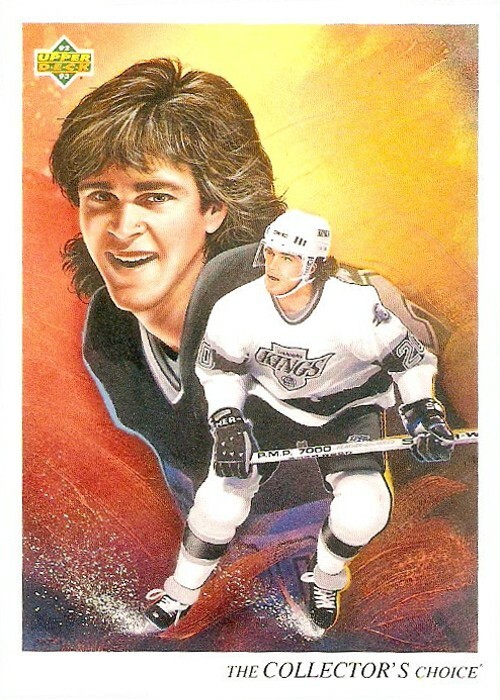 There is really nothing bad to say about this card at all, well maybe except for Luc's hair, but that was the "in" style back then, right? I wouldn't know, I was only four years old when this set came out. Other than that, this is just an amazing looking card. The colorful background really works well with the black and white of the Kings uniforms. Add to that the sprayed ice effect, as well as the whole thing set inside a simple white border, and we've got a winner. Even the UD logo doesn't look too out of place on this one, and I must say I like the addition of the "collector's choice" text at the bottom. That's all I have to say about this one. What do you guys think? Lately I've been thinking about expanding a bit here to include some items in my hockey collection other than cards, in this case jerseys, as you can tell by the title of the post. Over the years I've put together a nice little collection of replica jerseys and I thought it would be neat to share them here. 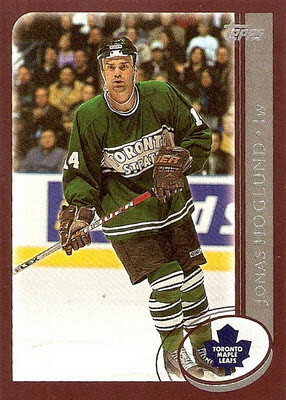 Rather than just pictures and a few words about each jersey, I'm going to try and do something a bit different and find a card that depicts each jersey for a nice tie in with my hockey card collection, because Card Boarded is a blog about hockey cards, right? This first one is one of my favorites and the one I wear most when heading down to Joe Louis Arena for Wings games. It's a home red Pavel Datsyuk jersey that I received as a birthday present a few years back, although supposedly it came from a garage sale. Even if it did, I can't complain because it's in great shape and looks like the real deal as far as replicas go. First, here's a look at the front of the jersey. As you can see, it's your typical dark Red Wings jersey with the single white arm stripe on either side and the white bottom edge. Beyond that you have the crest in the middle and the small Koho logo on the left arm. On the back, you've got Datsyuk's number 13 with his name arched in Red Wings' fashion above it as well as the Koho text and small logo in the center above the player name. Also, if you look closely, you can see the NHL puck logo in the lower right corner. These jerseys were worn prior to the switch to Reebok after the lockout, so I believe the last season they saw action was 2003-04. This was back when CCM produced the road white jerseys for all the teams and Koho produced the home dark jerseys. Now, for the part where I'm doing something more than just showing off the jersey. 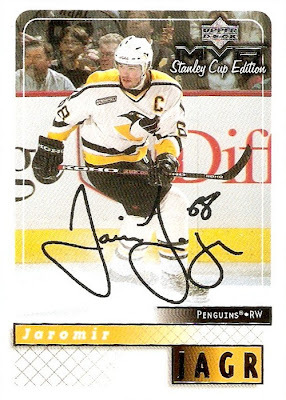 Here's a 2003-04 Victory card depicting the authentic version of my replica jersey. Well, that's the first one down. I've got about 20 replica jerseys that I will feature in this series. A bunch of them are Wings jerseys, but I do have some pretty neat jerseys from other teams too. What do you guys think, is this a good idea for a topic here? Ok, so those of us using blogger have the awesome ability to track how many people view our blogs on a daily basis, as well as where those views come from. Yesterday I noticed I crossed over the 50,000 views mark just after lunch time. Pretty cool, right? Well, when I actually looked at my stats for the day, I realized I had over 6800 views, for the day. I'm thinking to myself, "What the hell?" I've only had just under 50,000 total views since they started tracking stats last year. Well, when you get a plug (well, an indirect plug) on an ESPN.com article, you're going to get some additional traffic, wouldn't you think? When I checked the traffic sources, I noticed a ton of hits from an ESPN.com link. So I click on the link and I'm taken to an article titled, "Uni Watch's 2011 NHL goalie gear guide," written by Paul Lukas of the website Uni-Watch.com. The article is an awesome in-depth breakdown of goaltender's equipment for the 2011-12 season. The first part focuses on the masks for each team. About a third of the way down is the Detroit Red Wings. I see Jimmy Howard's name there with a click-able link. 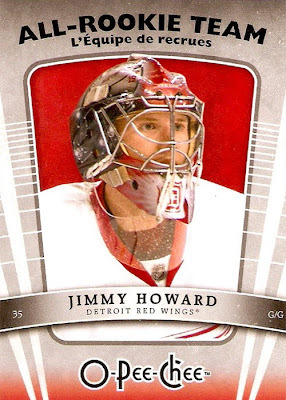 So I hover over the link and realized it's my post about Jimmy's new mask for this season. Awesome. If you haven't already done so, go check it out. I'm sure most of us use eBay on a regular basis to help knock things off of our want lists. I know I use it all the time and it's where most of my main PC project cards come from. That said, I've got my own "strategy" if you will, and since I don't have anything else to write about, I'll talk about that today. 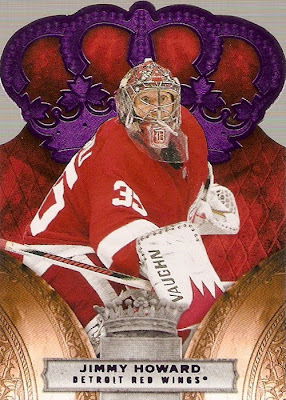 If you read this blog regularly, you know I've got three main PC projects: Jimmy Howard, MVP Stanley Cup Edition, and Metal Universe. So, these are usually the only things I'm searching for on the bay. In general, I usually search for a given project by first seeing what's ending soonest, followed by stuff that's newly listed. This covers both ends of the spectrum, and usually ensures I don't miss anything. Now, when I find something I like that's ending pretty quickly, I'll look at where the price is and determine whether or not that card is worth that amount of money to me. Sometimes it is, sometimes it isn't. If I want it, I'll bid until I can no longer justify it, which usually lands me I'd say less than 50% of the stuff I bid on. That doesn't mean I'm cheap, it just means I'm trying to work within a budget, as I've got more important stuff to worry about like a new car payment and student loans at this point. That's the easy part of searching. The hard part is knowing what search terms to use and finding stuff that is either poorly labeled or just completely mislabeled. 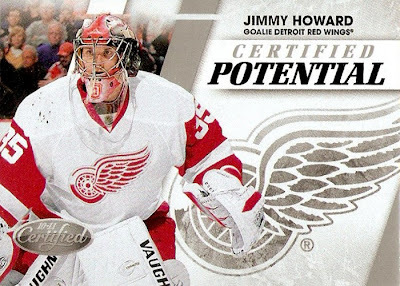 I don't even want to think about how many listings I've seen for things like a "2009-10 Jimmy Howard RC" or "2000-01 MVP SC Edition." I know it's not a huge deal, but it's annoying when you do a search by year and end up missing a bunch of stuff because the seller doesn't know what they're typing in their description. To make things easiest on myself, I will do two separate searches for Howard stuff. 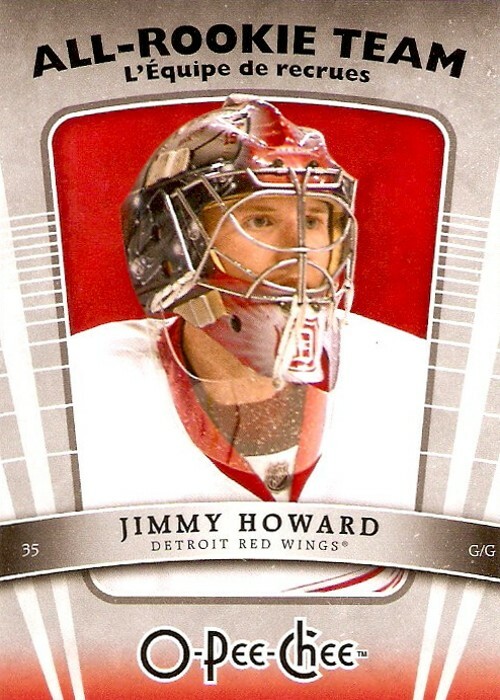 I will usually first search for "Jimmy Howard" and then search for "Jim Howard." I've talked about this before here, and doing both ensures I don't miss anything. Heck, sometimes I even just search for "Howard" in the hockey card category, which is normally ok, but does bring up some unwanted stuff. When it comes to MVP stuff, I usually just search for "MVP" in hockey cards, but that becomes a problem when there is the regular "MVP" set from the same year, which basically doubles the number of results I have to sort through. To get around this, and knowing I don't need any base cards, I will search for things like "Super Script" or "Golden Memories" in hopes that the listings are accurate. The Metal Universe stuff is easy because there's not much of it even on the bay, and it's a plus that there was only two years of it in hockey. In this case I just type in "Metal Universe" in the hockey cards and pretty much see everything of interest in the first page of results. That's pretty much my eBay "strategy" in a nutshell. I'm curious, what is your general strategy or thought process when it comes to the bay? 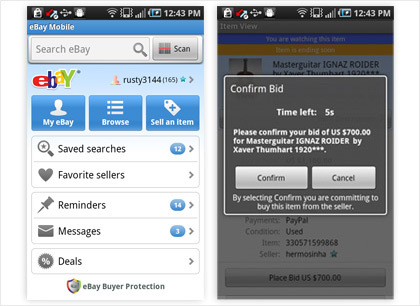 Another thing I've discovered that I really like lately is the mobile eBay app for my phone. Just the other day I was sitting on the couch watching a movie and managed to find, bid on, and win a nice piece for one of my PC projects, all without even getting up. For me this could almost be a negative, in terms of over spending, because now I have the entire bay at my fingertips whenever I want. It definitely requires a little more self control on my part, but at the same time it's brought me some nice stuff for the PC. Have you made use of the mobile eBay app yet? Do you like it? And do you think it's a good thing or a bad thing being able to buy cards wherever and whenever you have a good signal? Sometimes, well a lot of times, there are things more important than a simple hobby like collecting cards. This past weekend was a great example for me. I spent Friday night with a friend over in Grand Rapids, which included a trip to the comedy club and a dueling piano bar, followed by a very windy nine holes of golf Saturday morning. All the while, this blog and the hobby in general didn't really enter my mind all weekend, which was nice for a change. So with my mind free and clear in terms of blogging and hockey cards, I'm really only posting this today because of the latest bubble mailer waiting for me in the mailbox after work. This time it's another lot from eBay, and again it included at least one card I already had when I bought it. There were five in all though, so that means four new ones for the collection. Let's start with the duplicate of the group, or should I say triplicate as I've actually already got two of these thanks to previous lots from eBay. It's a 2005-06 Trilogy Rookie Premier, this time numbered 371/999. Next is another jersey card for the collection. 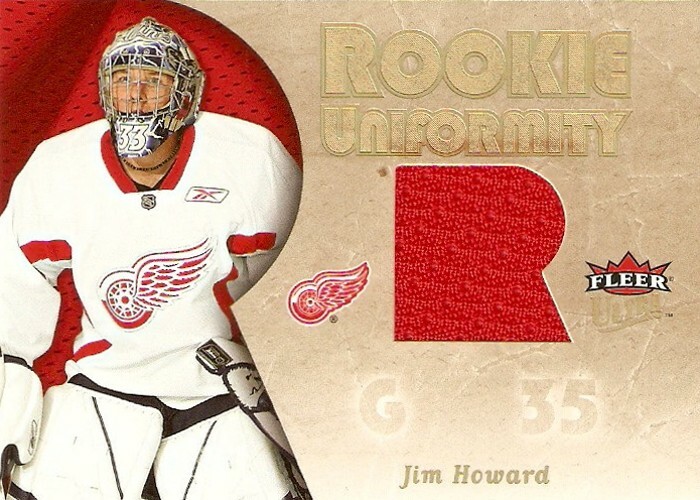 It's a Rookie Uniformity from 2005-06 Fleer Ultra. This one is non-numbered and has a nice red swatch. The only thing I don't like about this one is that they have a picture of Jimmy in a practice jersey, while the card from the base set has a game action photo, although it beats a photo shoot, right? Next is another RC that's been on my radar for a while, I've just never been able to justify the prices I see it going for on ebay. I'm talking things like BIN's for $30 or more, that's just a bit too much for me. So this one is a definite welcome addition, plus its an acetate card, and who doesn't like acetate cards? Here's one of those pesky red parallels from Victory. These things were exclusive to the retail rack packs as far as I know and I was never lucky enough to pull one for myself. They're the exact same as the base version, except for the red border, which works quite nicely with this and any Red Wings cards for that matter. Now for a love-hate kind of card. I love the look of this card when I'm actually holding it, but I hate scanning it and trying to make it look presentable. Not really sure about the name of the set here, or am I just missing something obvious, because it seems kind of dumb to me. That's it for now, these five bring the Howard collection to 85 overall including duplicates, which means I've now got 80 unique pieces. Now, as far as what I got these for. The lot ended up coming in at just $16. Throw in the $3.50 for shipping and I got myself a nice five card lot for just under $4 per card, not bad at all. After reading Brett's latest post over at MHCO, I think I'm in a bit of a mini-funk myself. Since I posted my latest Howard stuff from eBay last week, I just haven't had any motivation whatsoever to write anything for this blog. Some of that is being busier at work and some is being busy with roller hockey in full swing again. The only reason I decided to post today is the package that was waiting for me when I got home. It contained three more Gold Scripts for my MVP Stanley Cup Edition master set project. I was lucky enough to come across them a few days back when doing my daily ebay searches. Each was listed at $0.99 so I put a placeholder bid on each and wouldn't you know it, they all ended at just $0.99. Even better was the fact that these were all from the same seller, which meant combined shipping. Here's a little something, can you spot the difference between the two regular golds and the CHL gold (no, I'm not talking about the big "CHL" and "prospects" at the bottom of the one). It took me quite a while to notice it at first myself. These three bring the Gold Script total to 32 out of 220. That's just over 14% of the set. Hopefully I can find some more deals like this on the bay as I still have a long way to go for the set, but progress is progress, right? Lately I kind of went on an ebay spending spree and ended up with a few nice pieces for my Howard collection, all of which came at a pretty good price if you ask me. Altogether, I made four purchases that brought me seven cards. The first to arrive was this purple parallel from 2010-11 Crown Royale. Although it's not shown on the front, it's numbered 22/25. I love the overall design of this set and am looking forward to tracking down the base version as well as some more of the parallels. The second to arrive was this 2005-06 Power Play Rookies. It's a lower end RC, but still a RC so I had to have it for the collection. The best part is I managed to get it for $0.99 delivered, although it was shipped in just a penny sleeve floating inside a 6" x 8" bubble mailer. I guess I can't really complain as it was unharmed and I technically didn't pay for shipping. This next one was another single card purchase. It's a silver parallel from 2010-11 Artifacts numbered 17/25. In the scan it looks like the foil is silver, but when you actually look at it in the light, it's got a nice rainbow tint to it. I think it's odd they didn't just stick with plain silver foil for the silver parallel, right? I got this one for just under $10 delivered, not bad eh? These last four were part of a lot I picked up a few weeks ago, they just took this long to finally arrive. This first one may look familiar and that's because it's the second copy I've gotten, the other being the card that started my Howard collection. This is where the lot gets better, with a card that I didn't already have. 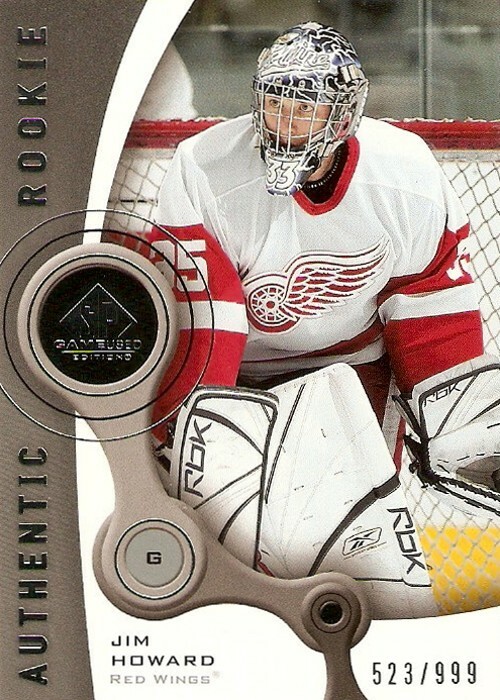 It's a 2005-06 SP Game Used Authentic Rookie numbered 523/999. This is another one of the RC's that has been on my radar all along, I just was waiting to grab it for a decent price. I think I did that, you'll see when I tell you how much this lot actually set me back. Now, for the best part of the lot. It's an autographed Rookie Jersey from 2005-06 SPx and it's numbered 0874/1499. Can you imagine sitting there and signing you name 1499 times, for just one card? Although I guess I wouldn't complain if I was getting millions to play the game I love, would you? 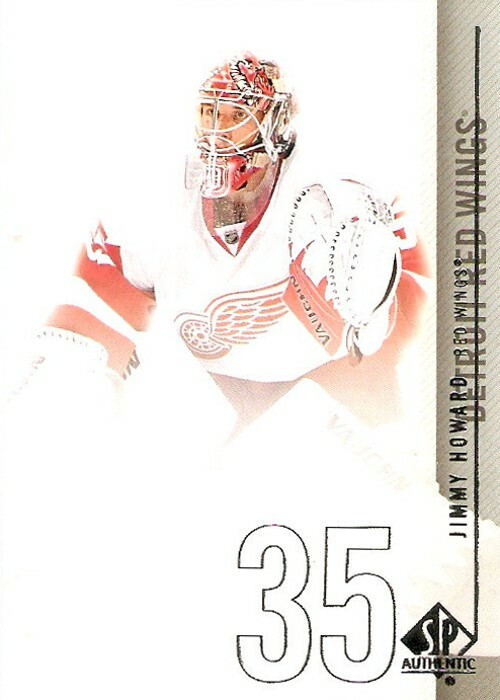 Despite the all white swatch and the sticker auto, I really like the look of this card. It also helps that Jimmy's got a halfway decent signature. Earlier I mentioned that I didn't mind buying two out of these four cards as dupes. That's because the entire lot set me back only $15 including shipping. I'm still surprised the final priced ended this low, but I'll take it as I don't come across many "steals" like this. I've seen each of the four cards here listed individually for at least $15. 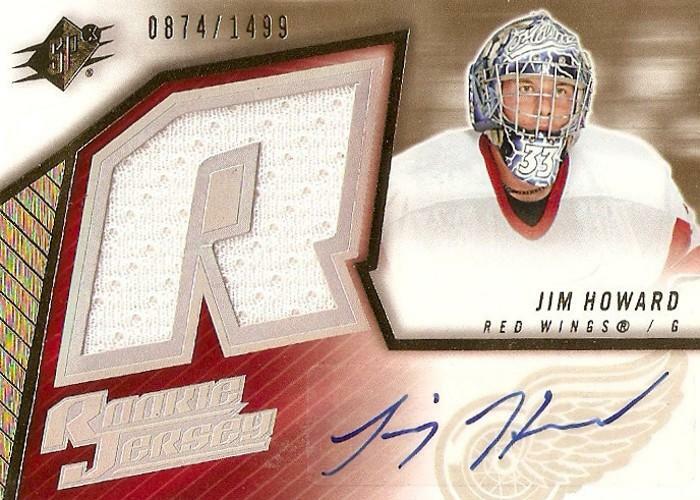 I've seen BIN's of the SP Game Used RC for as high as $19.99 and the SPx auto jersey as high as $50. To each their own though, I'm not willing to pay that much, so I got pretty luck with this lot. It's not unusual for the start of a new season to bring a new mask design for goalies. Sometimes that means a complete design overhaul and sometimes it only means a few small tweaks. 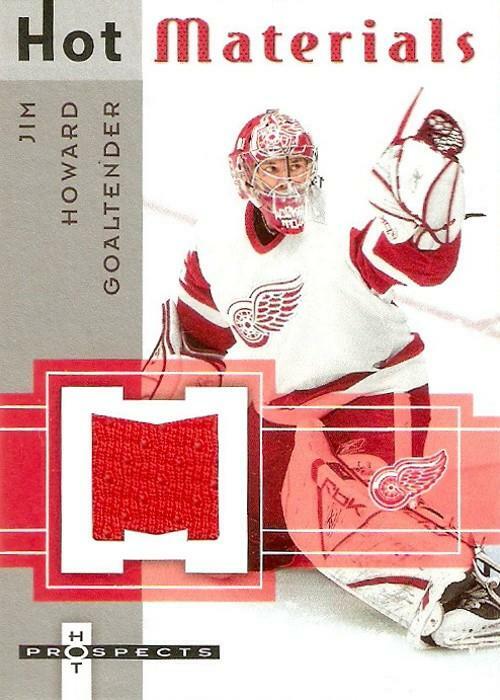 In the case of Jimmy Howard, it would be the latter of the two. 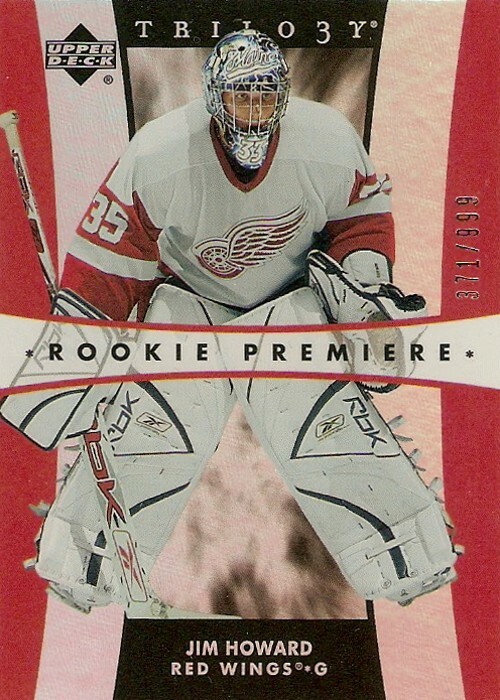 At first glance, you might think this is the exact same as last season, ignoring the back plate of course. It's got the same split design with the '67 Shelby on either side in front of the city skyline. It's also go the same old English "D" on the chin and the franchise's retired numbers. Now for the back plate, which would look awesome on a card (hint hint Brett). As I'm sure most of you know, the Locomotiv tragedy in Russia involved three former Red Wings: assistant coach Brad McCrimmon, goaltender Stefan Liv, and defenseman Ruslan Salei. The back plate features black and white portraits of the three along with their names and the words "Forever in Our Hearts." It's an amazing looking tribute to three great men, all of whom will be remembered by Red Wings and hockey fans around the world. 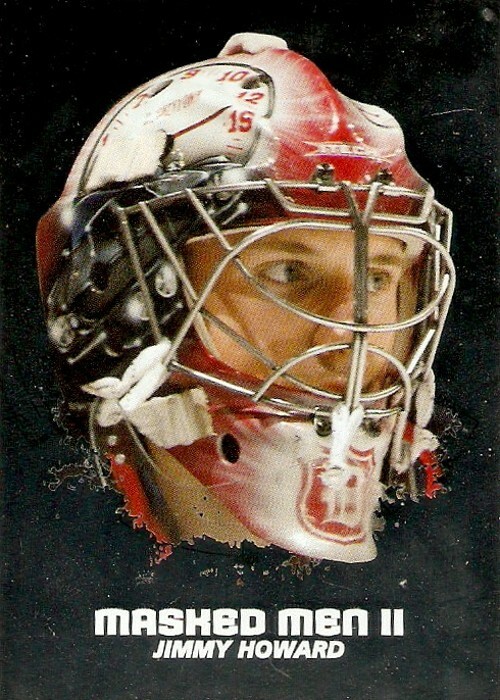 I wonder how long it will take for this mask to appear on a trading card. 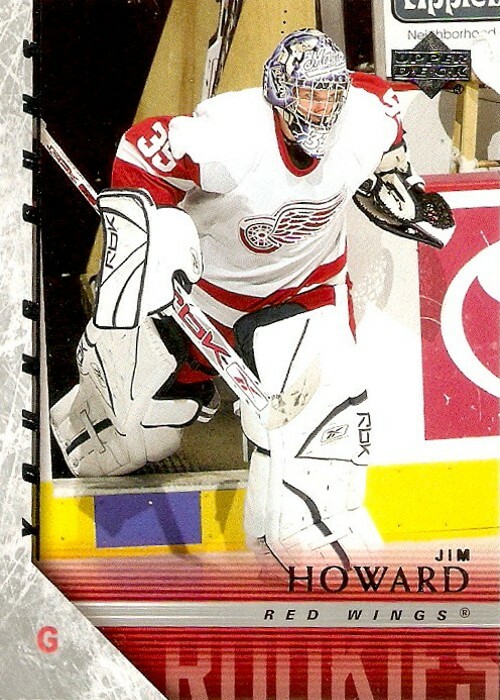 Last season, Howard wore his backup DocOc mask and that was featured in some early season releases, so we'll see. I really hope it makes it into whatever incarnation of a mask set In The Game has planned for Between The Pipes this year. 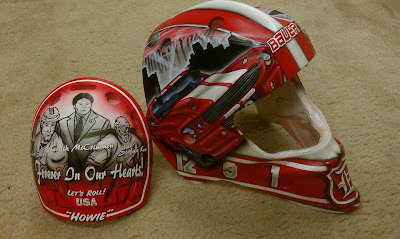 Here's a link to an article about the mask over at Puck Daddy. It also mentions Jaroslav Halak's back plate tribute to his former teammate Pavol Demitra, who was also lost in the plane crash. I think it's great that theyr'e using their masks for this, don't you? 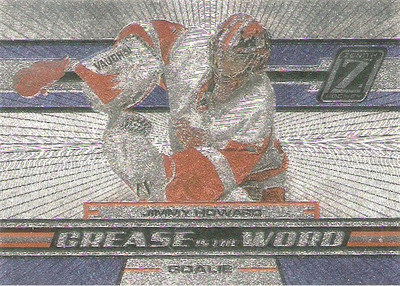 Like I mentioned in the last Silver Script update, the last remaining part of the trade I completed with Brett was all Jimmy Howard stuff. I managed to pick up some nice pieces for the collection including a key rookie and some nice inserts. Let's start with the one base card of the lot from 2010-11 SP Authentic. I never busted any of this stuff and I didn't feel like overpaying for shipping from ebay on a base card, so this is a nice addition. I love the simplicity of the design, although I think they went a little overboard with the fading. The scan just makes this one look worse for some reason too. 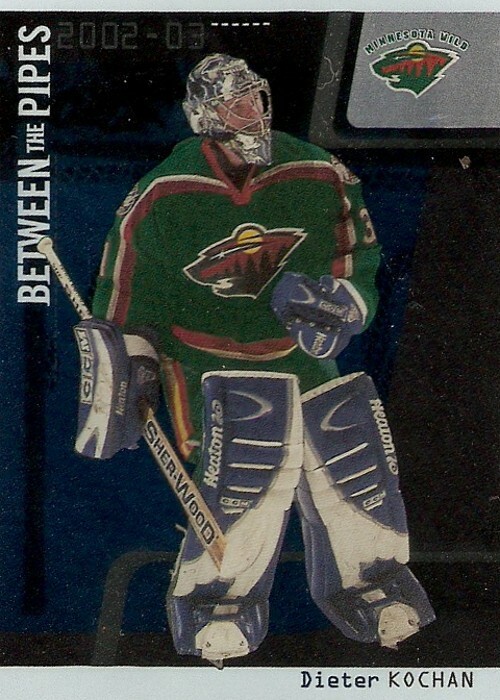 The next on is a retro parallel from 2010-11 OPC. I already have the rainbow version of this card, now I just need to track down the black border and the blank back versions. For some reason, I like the look of this one, especially with the yellow background and text for the team name, it give the card a more bold look. 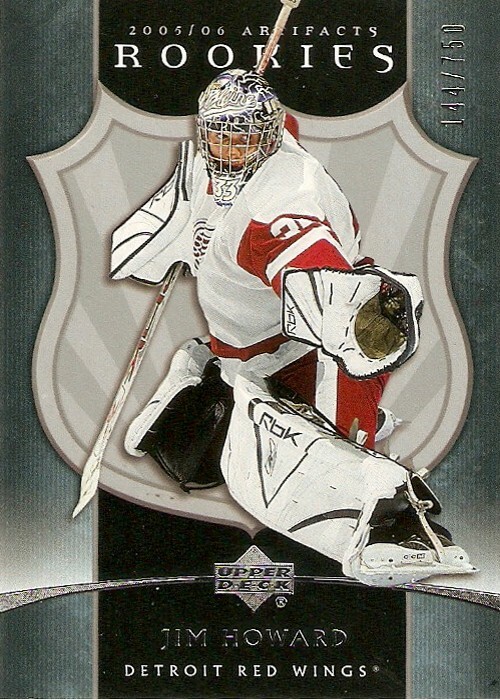 This one is also from 2010-11 OPC, but this time it's an All-Rookie Team card. 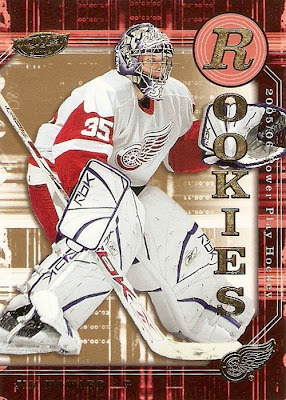 To me, it's still hard to think of Jimmy as a rookie for the 2009-10 season, but by league rules he was still considered to be one, despite the fact he played in his first NHL game way back in 2005. Now we're getting to the good stuff. As a player collector, the all-important Young Guns rookie card has been on my want list since the beginning, so it was really nice to finally add this one to the collection. This one would make a perfect candidate for my 'Goaltending Gallimaufry' project, but I think I'll exclude rookies like this from that set. This is another one I've been wanting for a while now. It's a Masked Men II from 2009-10 Between The Pipes. While I like the Masked Men sets, I still miss the old Mask sets where the mask was cropped out of the rest of the image. The card looks kind of dirty in the scan, but that's because it's got a mirror finish on the front and is impossible to keep pristine. 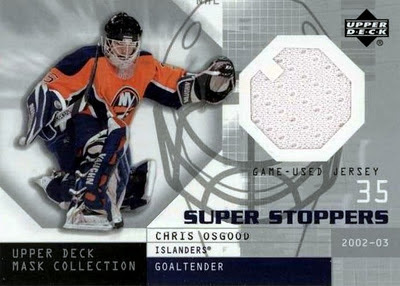 This one will go nicely with my Hot Prospects Auto Patch RC from a little while back, as they are part of the same set. It's got a nice red swatch, which is cool because it could have just been all white. 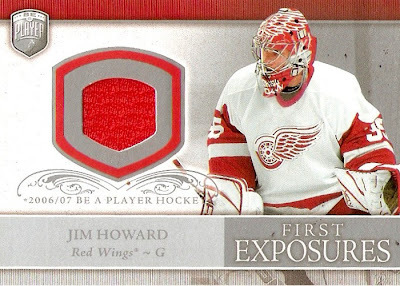 I will say I do like the look of this set, especially the M-shaped window for the swatch inside the larger H.
Here we've got another nice jersey card, this time it's a First Exposures from 2006-07 BAP. Again, it's a nice red swatch as opposed to a more boring white one. I like that the swatch window is in the shape of the BAP logo, as opposed to a simple and boring rectangle. The last of the Howard's I picked up was this Certified Potential insert from 2010-11 Certified. It's numbered out of 500 and is the start of another potential 'rainbow' for the PC, as it's the usual Panini parallel hell with this set, just like the base and Masked Marvels sets. That's it for now. These eight bring the Howard collection total to 73 including duplicates, 71 not counting them. I'm well on my way to 100 different cards now, which will be the next major milestone in the collection. Having only started this collection just under two years ago, on my current budget, I'd say I've done pretty well for myself. Among all the other great stuff from the trade with Brett, there was another important piece to the Silver Script portion of the MVP Stanley Cup Edition master set project. 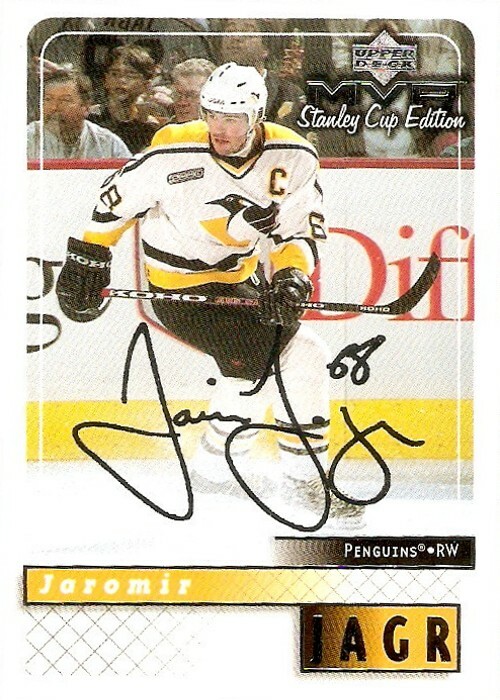 It was this Jaromir Jagr. Kind of weird thinking he'll be wearing the orange and black in Philadelphia this year after seeing this one, isn't it? 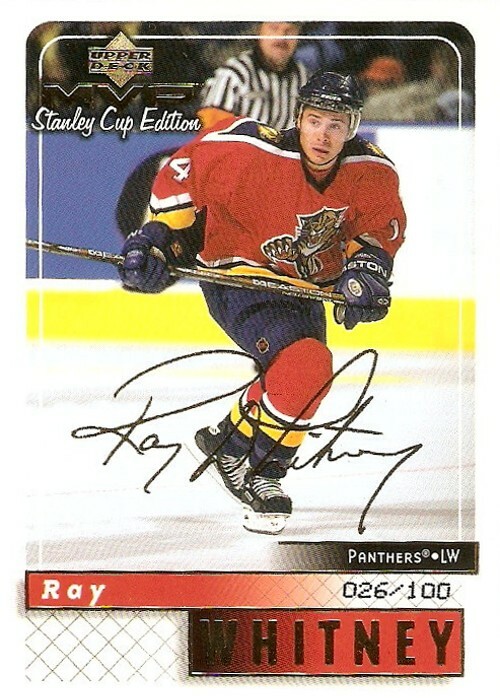 I will say that Jagr definitely has an awesome signature, assuming of course that this is an accurate representation of it. This brings the Silver Script collection to 112 out of a possible 220. That's pretty good progress, but I'd like to be further along given the fact that these were only inserted 1:2, but I'll take being over the 50% mark any day with this kind of project. 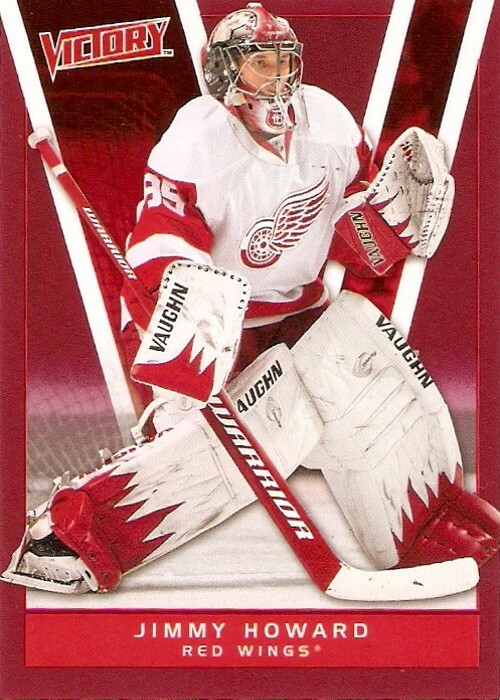 Well, this finishes off the non-Jimmy Howard portion of the trade. I'll have those cards scanned and ready to go in the next few days.